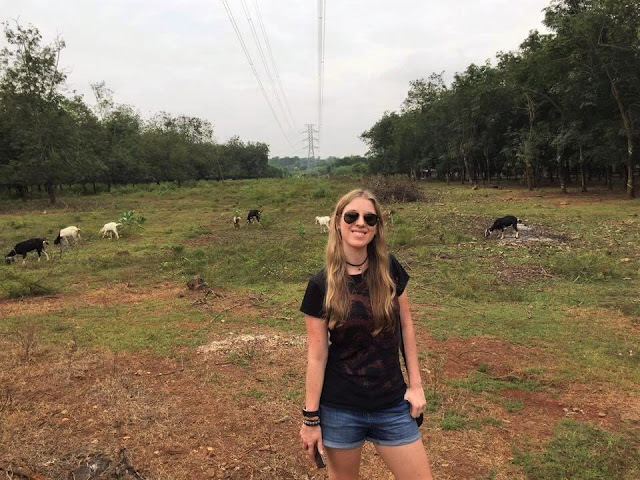 I recently returned from an incredible two weeks in Vietnam and this is the first of my travel diaries. 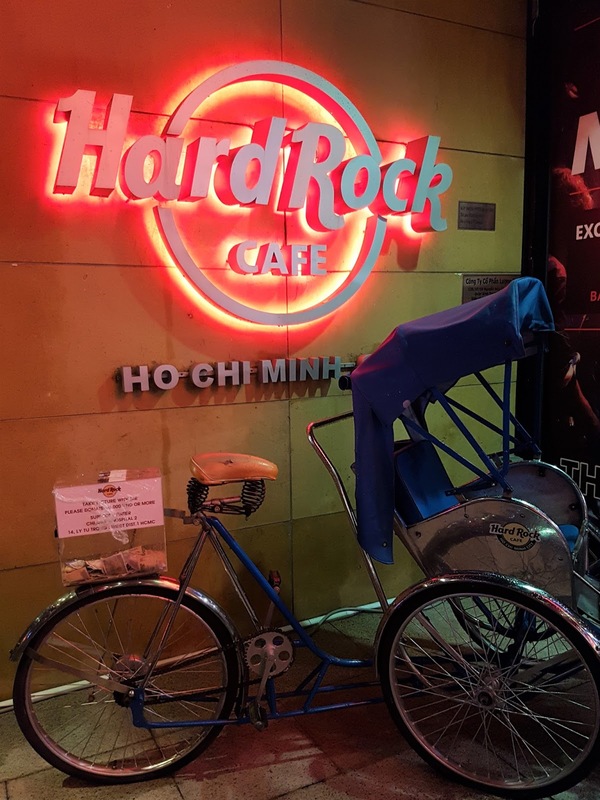 Here is my second one from Hanoi which includes thoughts and reflections from my time in Vietnam, and Halong Bay will be coming very soon. 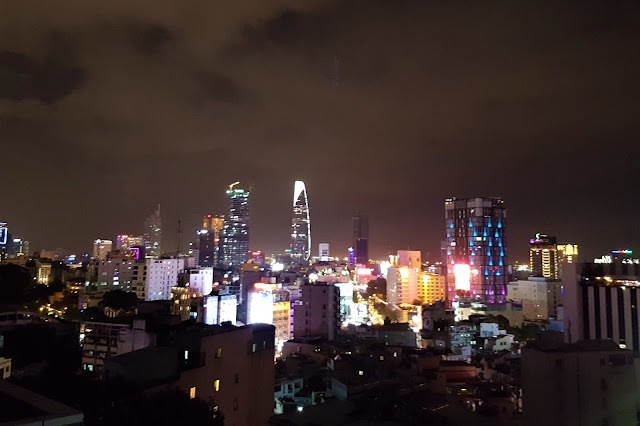 After a 3 am wake up call, a one hour drive to Brisbane, an 8-hour flight to Singapore, a 2-hour layover and another 2-hour flight to Ho Chi Minh City- we finally arrived in Vietnam’s largest city. It was around 7 pm local time I believe (which was 10 pm our time). 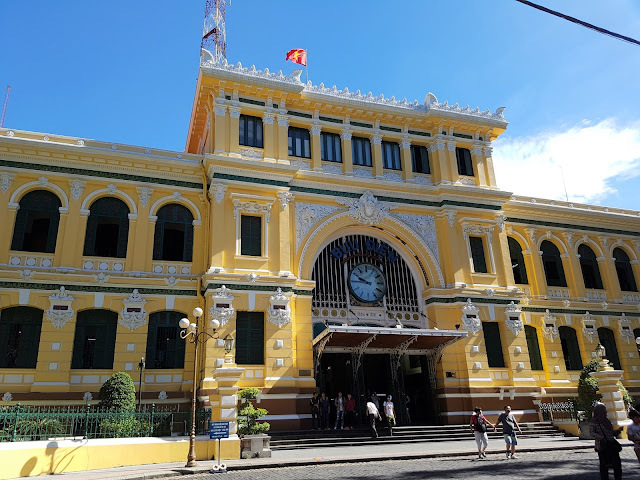 We had pre-approved visas which took about half an hour to get processed before we were allowed through customs, mostly due to the line of people. You can apply for the visa online, then once it’s approved, print out the official document you get emailed to be stamped when you arrive. 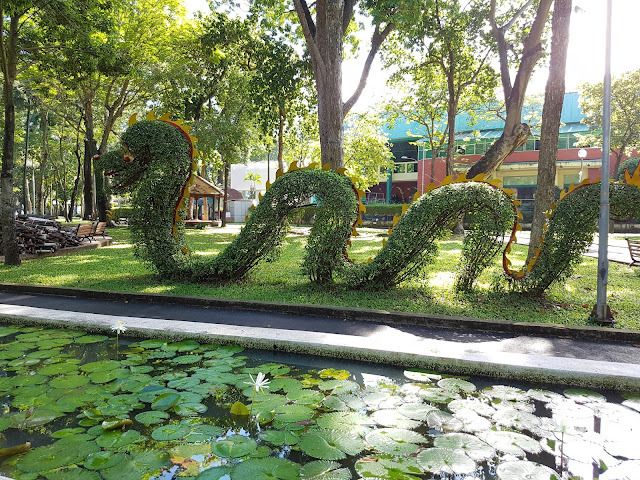 It costs $25 USD per person for a single entry visa which lasts for a month, which you pay upon arrival. It was a simple enough process. 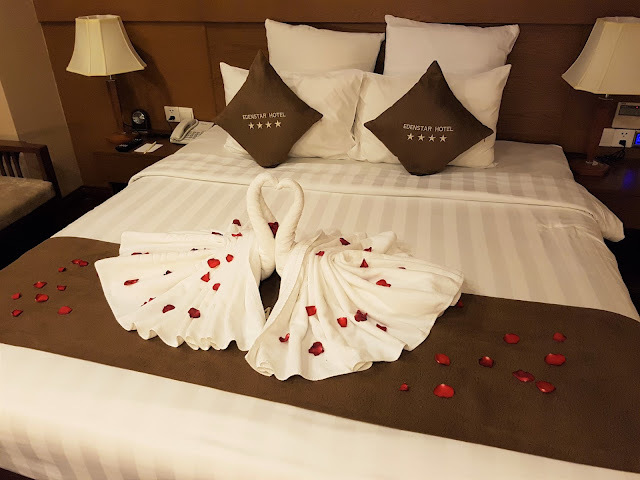 We had arranged a transfer to our accommodation which was the Edenstar Hotel. 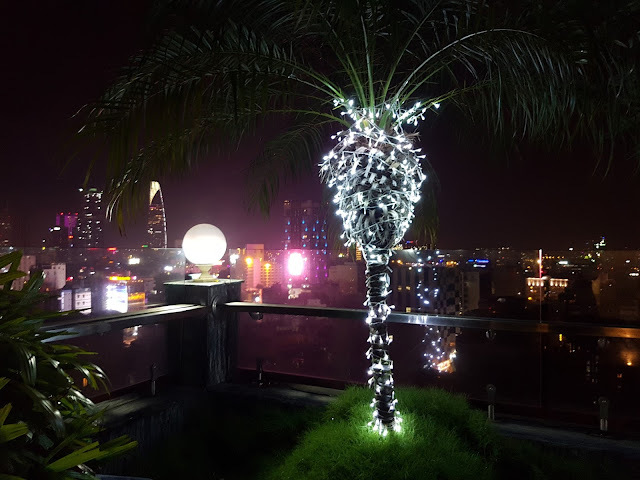 My first impressions of the city driving from the airport was that it was very modern, the streets were lined with technology billboards and lights decorated for Christmas. Shop windows and restaurants had great displays and decorations. 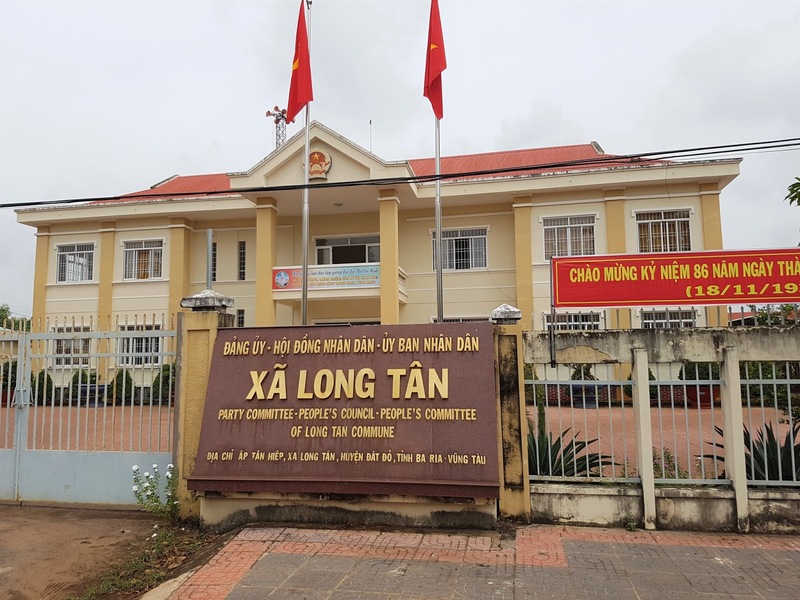 I was really surprised by that- because Vietnam is one of the least religious countries in the world (not that you have to be religious to be into Christmas). 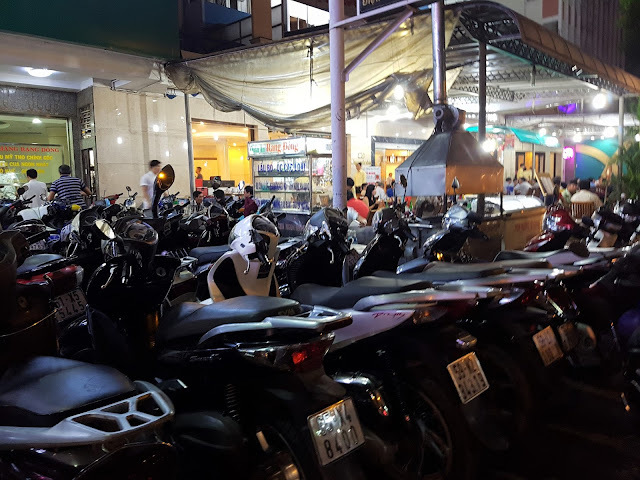 HCMC (Ho Chi Minh City for short) is similar to Bangkok- in that there is crazy traffic and a million scooters zipping in every direction, usually with whole families on them! Something I’ve never seen before which was the absolute highlight of my day was two people on a scooter- and in the middle of them was a dog! Such a funny sight! I wish I had my camera ready for a photo. We checked into our hotel which was lovely, it even had a grand foyer with an enormous Christmas tree in the middle. I’ll be doing a hotel review of them in the near future, so stay tuned for that! As we were quite tired and it was getting late we basically went straight out for a little exploration of the street we were staying on in search of food. 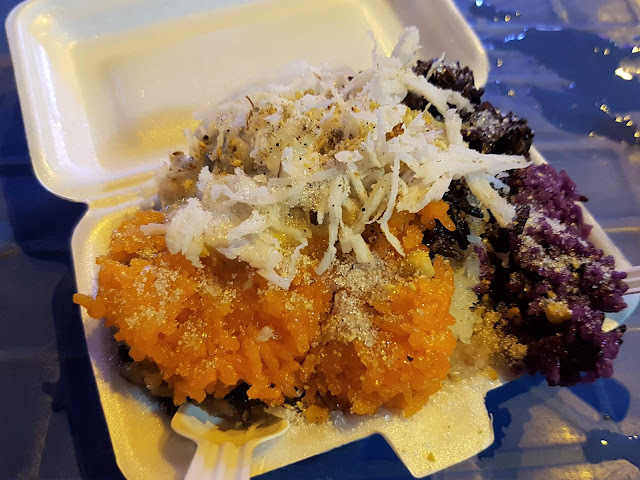 Our street was not in a touristy area so all of the food options were local- which was just what we wanted! We settled on a popular looking place filled with locals drinking beer and eating seafood. 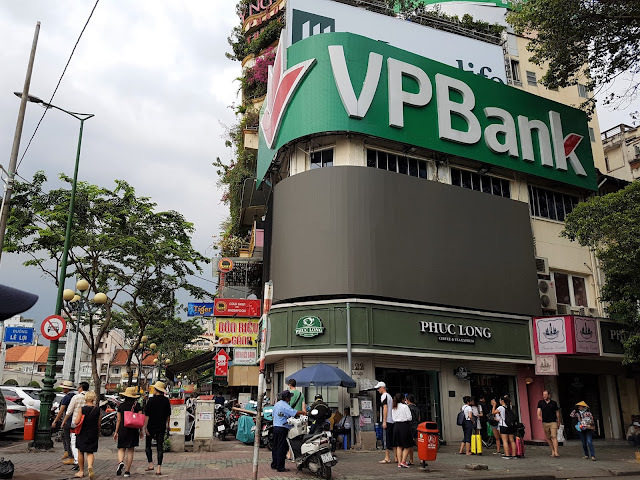 Vietnam is one of the highest beer consuming countries per capita in the world- and it’s incredibly cheap, from 50 cents in local convenience stores to $1-$3 in bars, depending on how up-market the place is (we were in heaven!). 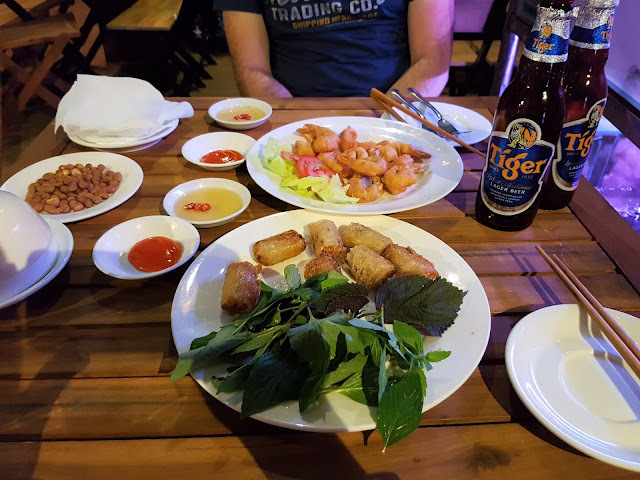 We weren’t overly hungry so we shared two plates of deep fried spring rolls and deep fried prawns (really good) which we washed down with a couple of Tiger beers each. 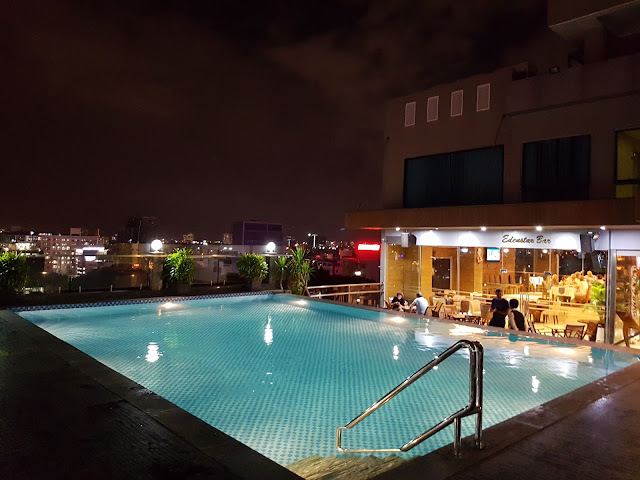 We went back to the hotel after that and checked out the rooftop pool bar area which had a great view over the city. We had a nice cocktail each before retiring to bed. After an excellent breakfast of pho (Vietnamese noodle soup; their traditional breakfast) and plenty of coffee- of which the Vietnamese have aced, we ventured out for the day at 9 am. It was a typical hot day of about 33 degrees. We crossed some crazy roads which although I got used to after two weeks- it was still nerve racking each time. Traffic doesn’t stop in Vietnam. Not even at pedestrian crossings. 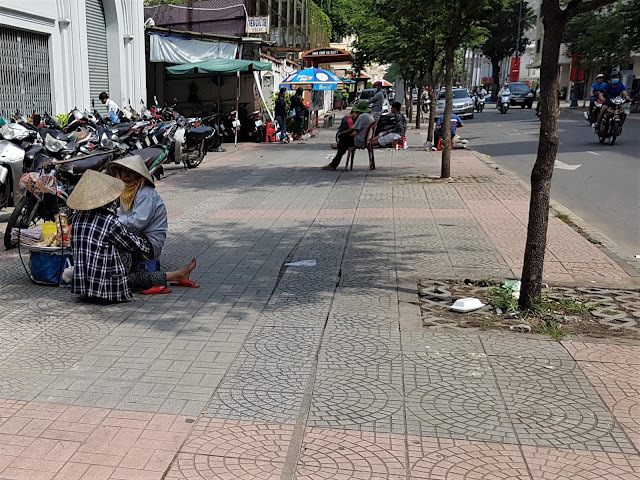 This is how you cross a road in Vietnam: you walk very slowly and keep going – and the scooters and cars go around you! Rather terrifying indeed. At least I had a human shield with me (my husband). You’re not even safe on footpaths as scooters use that just as regularly as roads- and they also park there too, often blocking the whole path and making you walk back on to the crazy road! 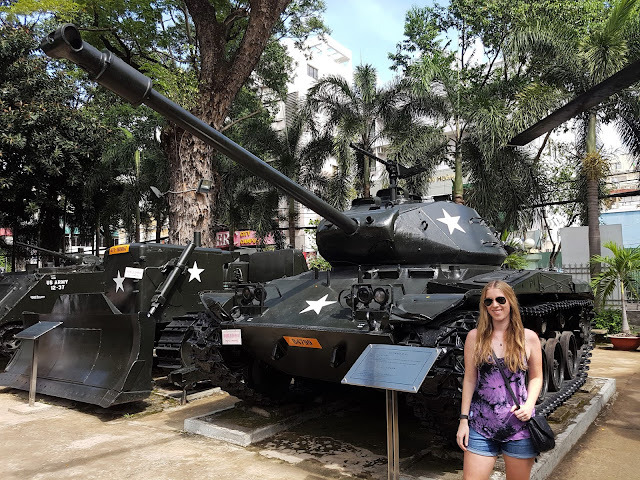 (I found this was worse in Hanoi). Anyway– we ventured across roads, through beautiful parks, I saw a smoking nun and a guy carrying a tray of doughnuts on his head! We came across the magnificent Notre Dam Cathedral. It was impressive from the outside, but I found the inside not so special. I guess I’ve just been to so many amazing cathedrals that I’m pretty much a snob now! We found a nifty shop that sold some pretty cool souvenirs and we both did a bit of shopping in there for presents. I even bought myself some cool Lord of the Rings cloth posters. The next stop was the Ho Chi Minh Revolution Museum which cost 15,000 VND (Vietnamese Dong) each (about 90 cents). There were helicopters, a tank and cannon outside of the building. There was a lot of historical and war artifacts and information, but it wasn’t so much my thing (it was Gareth’s). We then sought out a lunch place and came across a local food court that had so many food choices it was very hard to choose! I ended up going for a BBQ pork and wonton noodle soup and it was really good. Both of our lunches including drinks came to only $10! 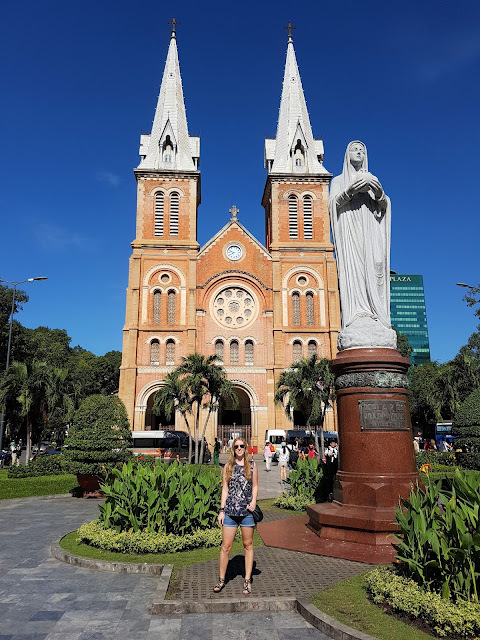 We checked out the Saigon River, then the famous Ben Thanh Markets, but we didn’t spend long in there. We had pretty much been walking for 5 hours straight and had sore feet so we made our way back to the hotel in the afternoon for some pool time and a refreshing beer. 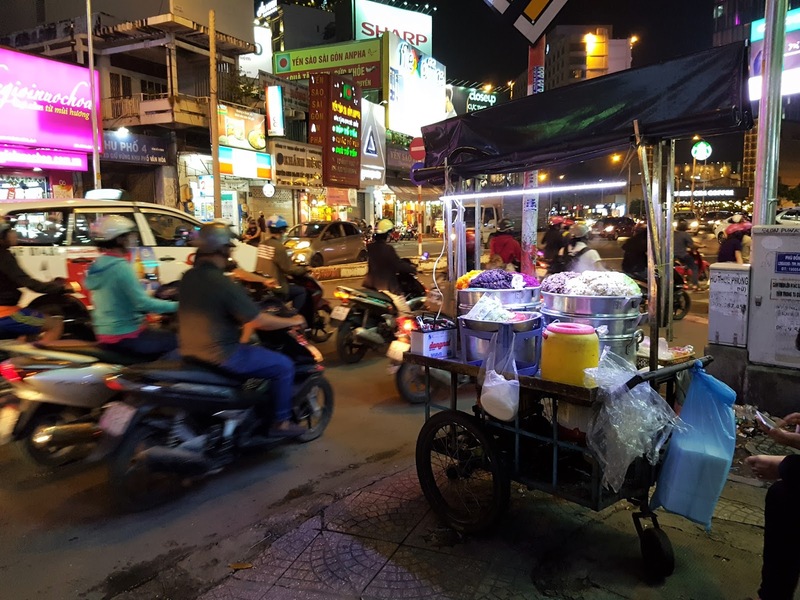 That evening we had booked a street food tour Saigon Street Eats on the back of scooters! We were picked up at 5:30 pm and it was a full 3.5 hours of non-stop eating. 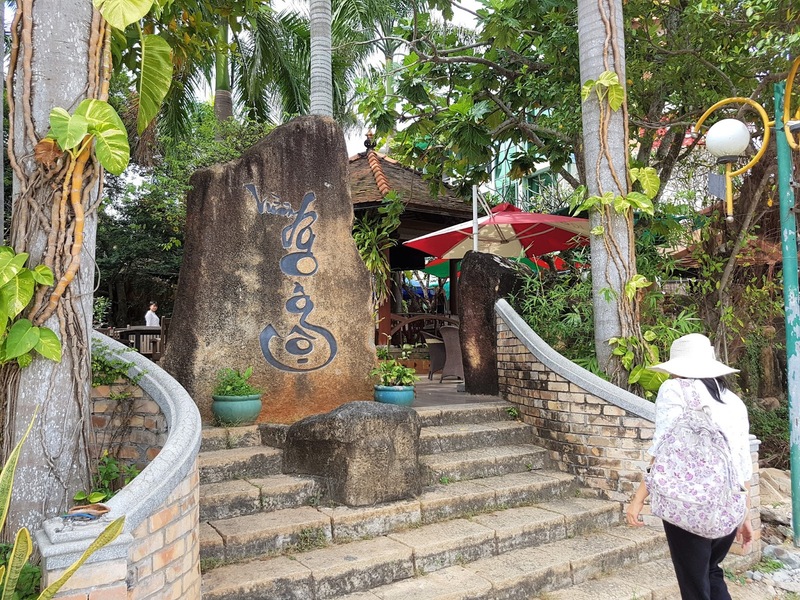 We were taken to District 3 (the city centre is District 1) and tried many local dishes that were all delicious. We found the tour through Trip Advisor as it had such good reviews and it was everything we could have imagined. 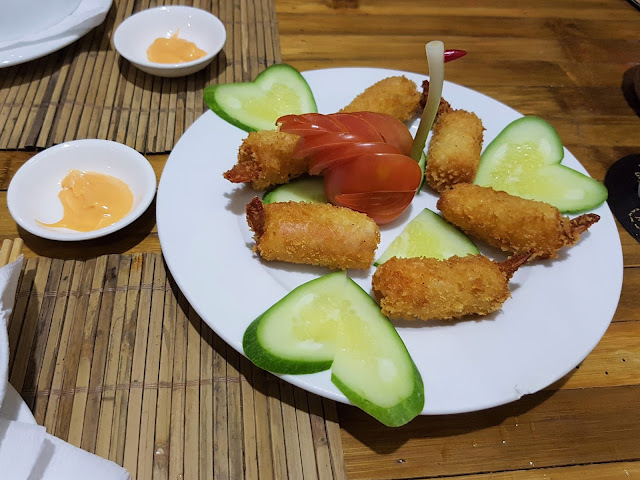 We had fresh Vietnamese pancakes, learned about Bahn Mi, had ‘broken rice’ with pork, tried frogs legs (tastes like chicken! ), had a BBQ chicken and a big steam boat. Then were the desserts! 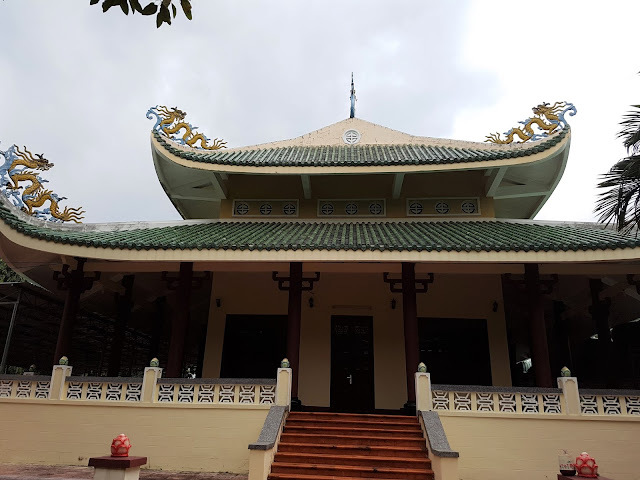 We were so so full at the end and the guides were so friendly and informative about all sorts of Vietnamese facts. It cost $55 each- which is expensive for Vietnam I suppose- but for us tourists for what we got it’s an incredibly great deal as it includes transfers and beer and water at every stop. (I’ve been on food tours in Paris which cost more like $150 and you don’t get as much). I especially enjoyed the scooter ride home (less traffic and on the way there it was raining) and I was grinning from ear to ear. 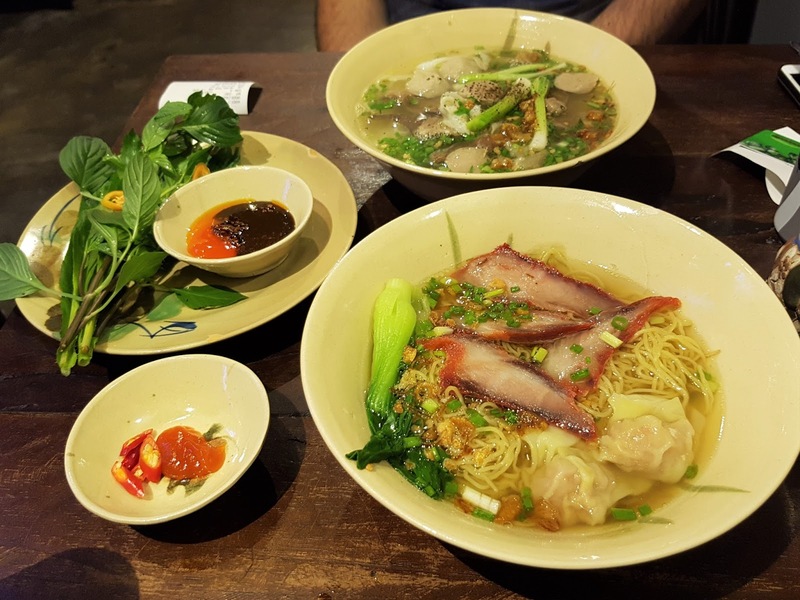 It was a brilliant night and a fantastic way to be properly introduced to the Vietnamese cuisine. 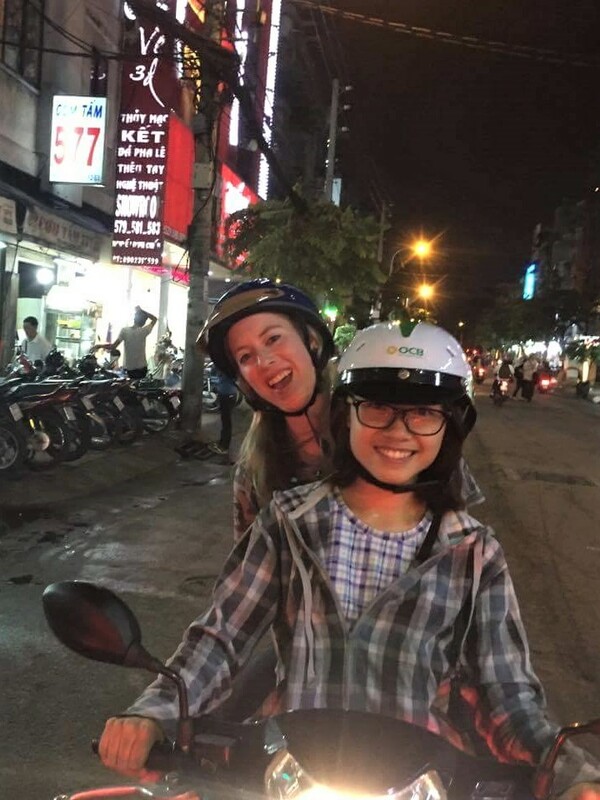 Riding on a scooter in Saigon- check! We slept in! We got over 10 hours sleep which felt amazing, as boy travelling takes it out of you! After breakfast we walked to the War Remnants Museum, which was only about 15 minutes away. 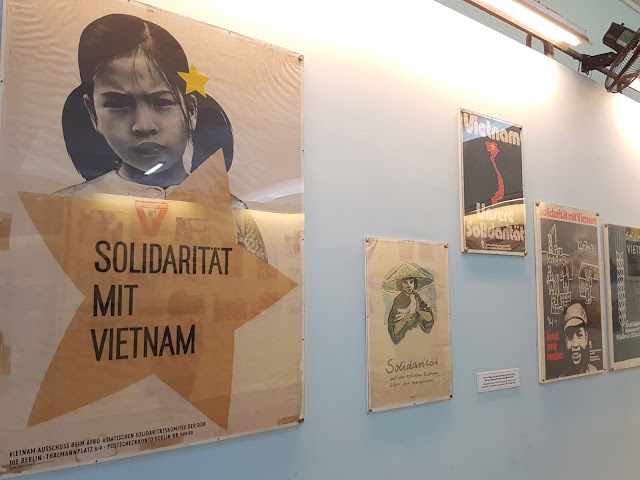 It’s also known as the museum of Chinese and American aggression and war crimes and it’s the most popular museum in HCMC. Outside the grounds were littered with giant US Army planes, helicopters and tanks. Inside the museum… was another story. 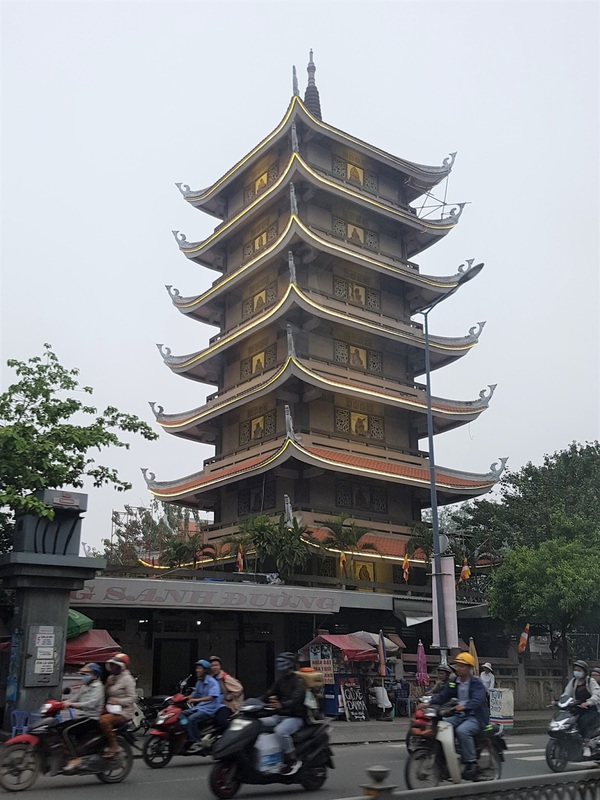 There were three levels which told the stories and history of Vietnam, from the first Indochina War involving the French colonialists to the most recent Vietnam War. It was very graphic and horrifying. I won’t go into detail. But I was very shocked. They have a very tragic past which scarily wasn’t that long ago at all- and the effects are still very evident today. The museum shut from 12 pm – 1 pm (as most places do for lunch), so we had a light lunch next door from Highlands Coffee- a very popular coffee shop you can find on nearly every corner. 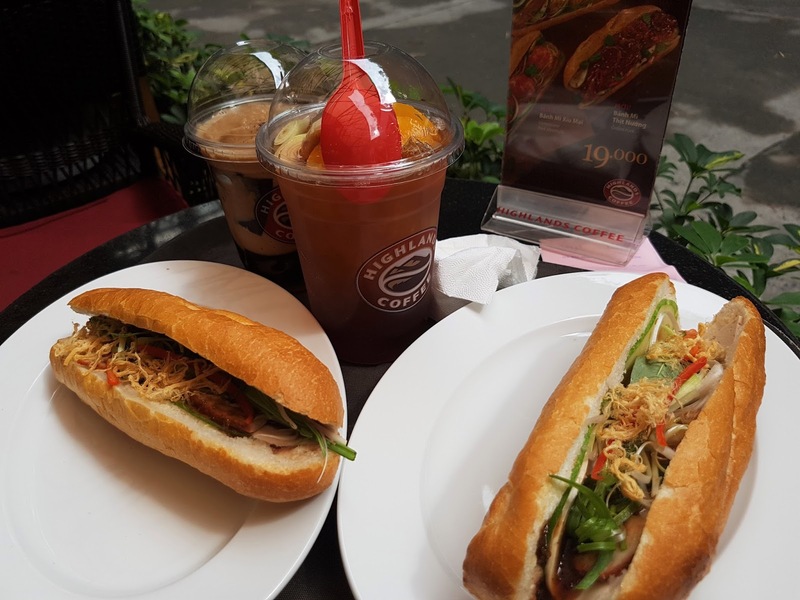 I had an iced coffee and my first Bahn Mi (Vietnamese baguette) which was good- but could have done with more filling, it was a tad dry. After that we rushed back to the hotel as we had an afternoon tour booked and pick up was at 1 pm. We were going to the famous Cu Chi tunnels- which is an elaborate network of underground tunnels. It was about an hour and a half drive away. 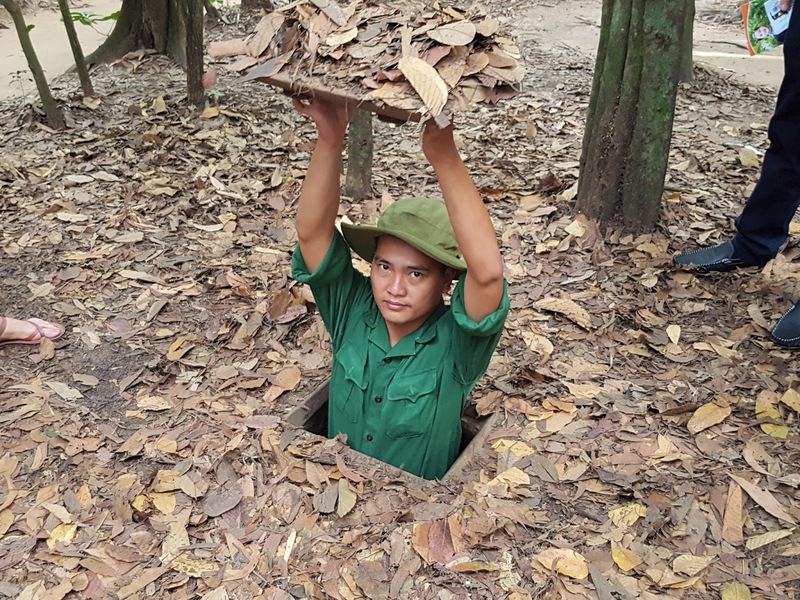 The communist guerrillas known as the Viet Cong dug tens of thousands of miles underground and used them as hideouts, living quarters and supply routes during the Vietnam War. We were shown around different sites, hidey holes, all of the different booby traps they used and even got to go through a part of the tunnel ourselves. The tour cost $35 each. 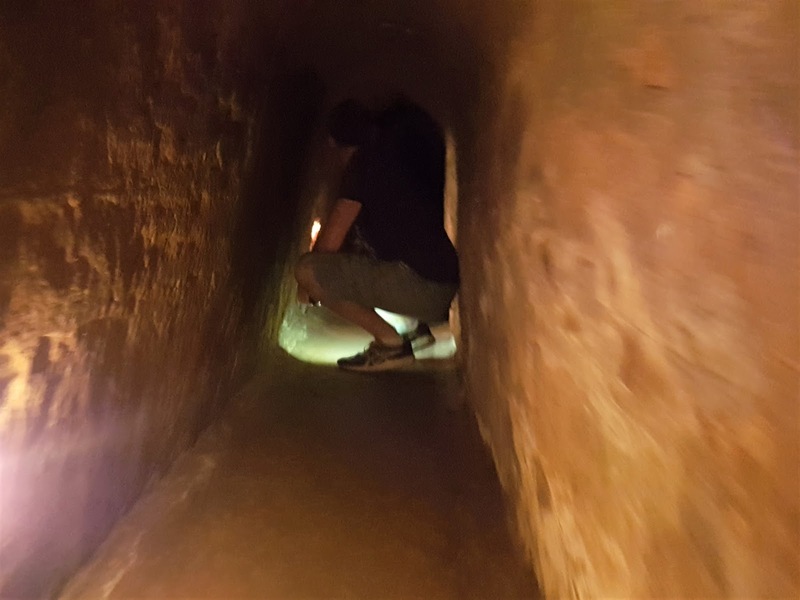 Gareth struggling through the tiny tunnels as he’s 6 ft tall! It took 2.5 hours to drive back because the traffic was so bad. 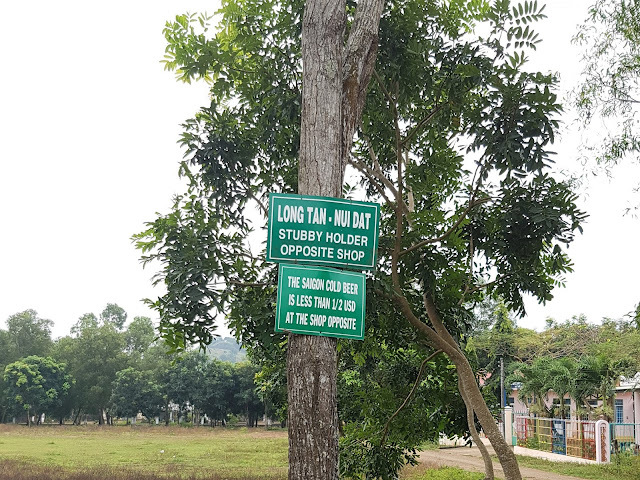 It was really frustrating as the site is only 70 kms away! Eventually we got back at 7 pm. Gareth had looked up on Trip Advisor the top restaurants in HCMC and found #5 was only a five minute walk away. I was keen! 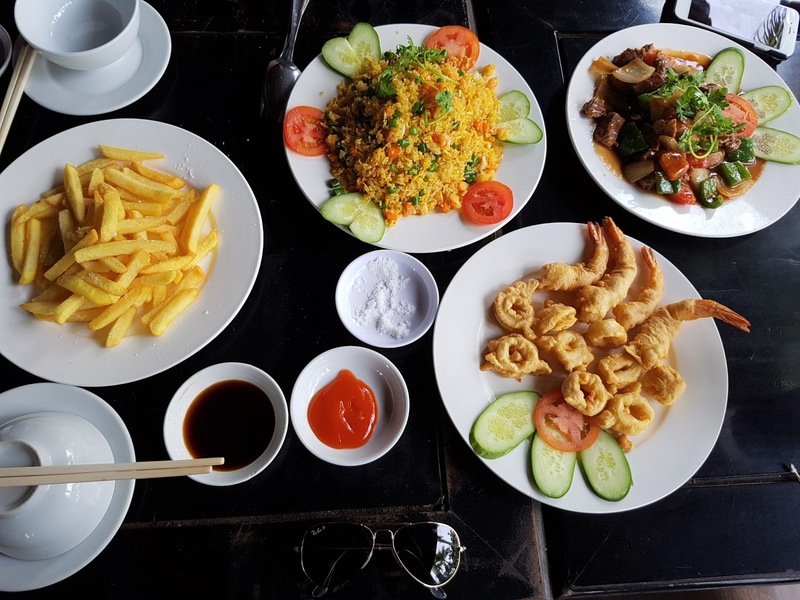 It was called Cyclo Restro and it was a 5-course set menu dinner (I will also be doing a ‘Best Places To Eat’ post for here and Hanoi and will go into more detail). We started with deep fried prawns with a dipping sauce (delightful) and this decorative swan just made my heart melt! I already loved the place! Next was a refreshing melon soup which was a delicious broth with melon that tasted like cucumber- it was so hydrating I felt like I was drinking an elixir. Then we had stir-fry green beans with a bit of beef, a lemongrass-y chicken curry dish and a fish and claypot vegetable dish with rice. 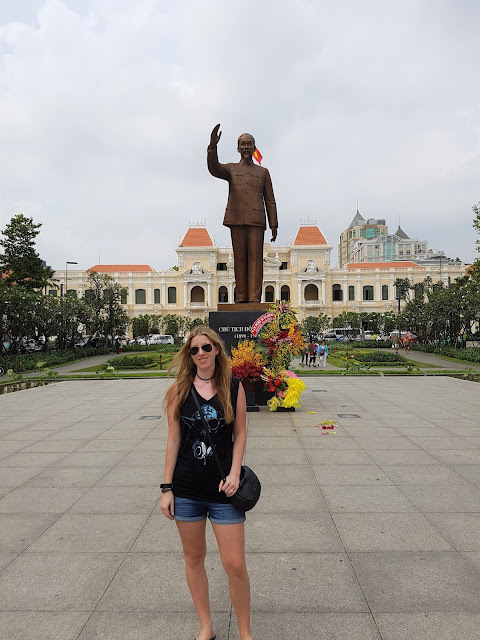 It was all simply stunning- I highly recommend this place for everyone visiting HCMC! We were so so full and satisfied and I loved how fresh, tasty and healthy everything was. We finished off with ‘Egg Coffee’ which I had heard about and was so excited to try. It’s one of the best things I’ve had in my life! 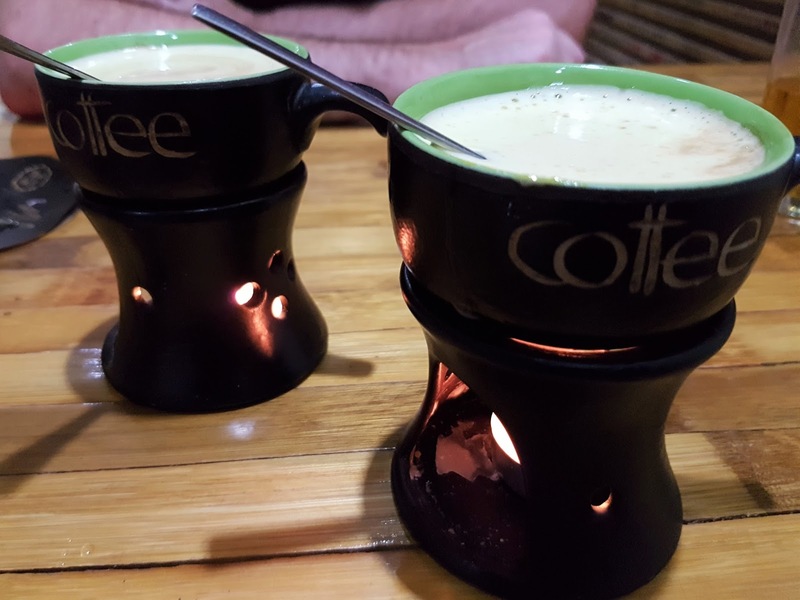 Over a flame candle burner, it’s coffee prepared with an egg on top so it has turned into a custard- you mix it together and it tastes like a liquid tiramisu- heaven! That whole feast to our surprise only cost us $16 total- which included two beers! We couldn’t believe it. We gave them a very good tip because that was honestly one of the best food experiences I’ve ever had. Today was an early start at 6:30 am as we had a full day tour booked to Long Tan- a famed ANZAC battle site. 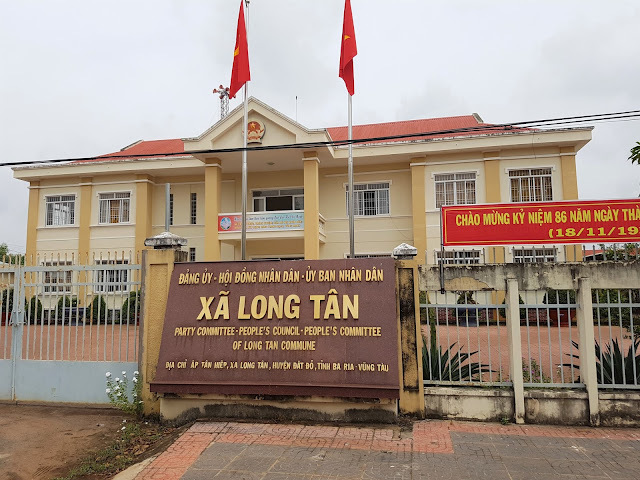 The Battle of Long Tan was an amazing piece of history of 100 Australian soldiers holding off 2000 Viet Cong and defeating them in 1966. (Gareth my husband is in the military so of course he had to do this tour!). Our guide was a lovely lady of about 50 years old and was very talkative- which was fine as it was a long drive! We learned a lot about her and her sad life story, as are most people’s at that age growing up through the war, starving. She in particular avoided being forced to marry at age 16 and instead travelled to HCMC to study and worked very hard jobs 18 hours a day to afford it. Her parents lost all of their land in the war and the government still to this day owns all of the land- so they were left with nothing. They are now retired with no pension so our guide has to support them as well as her own children. And she doesn’t earn much even though she is very well educated. It’s a hard life. 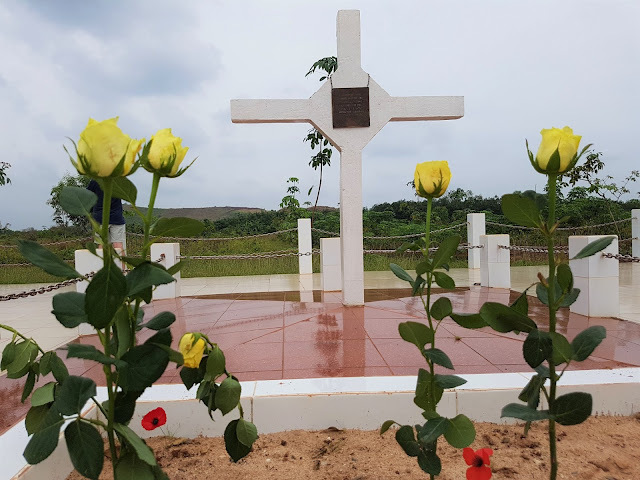 We were taken to the Long Phuoc Tunnels- similar to Cu Chi, the site of the former ANZAC military campgrounds, payed respects to the Long Tan Cross Memorial and were shown the battle sites. Gareth really enjoyed the tour and that’s the main thing! Afterwards was an included lunch which was quite a feast. They keep feeding us so much here! It was nearly a two hour ride home but we arrived back by 3 pm which was nice- we avoided the heavy traffic. Guess what else I saw just before we had lunch– a fluffy Pomeranian dog riding a scooter!! Okay not like that, but it was standing where the ladies feet were like it was on a skateboard and it looked so happy with its tongue wagging out and everything- again my camera was not ready! Just a cool building I saw on the way to the tunnels! We spent the rest of the afternoon chilling and enjoying a few drinks at the rooftop bar. 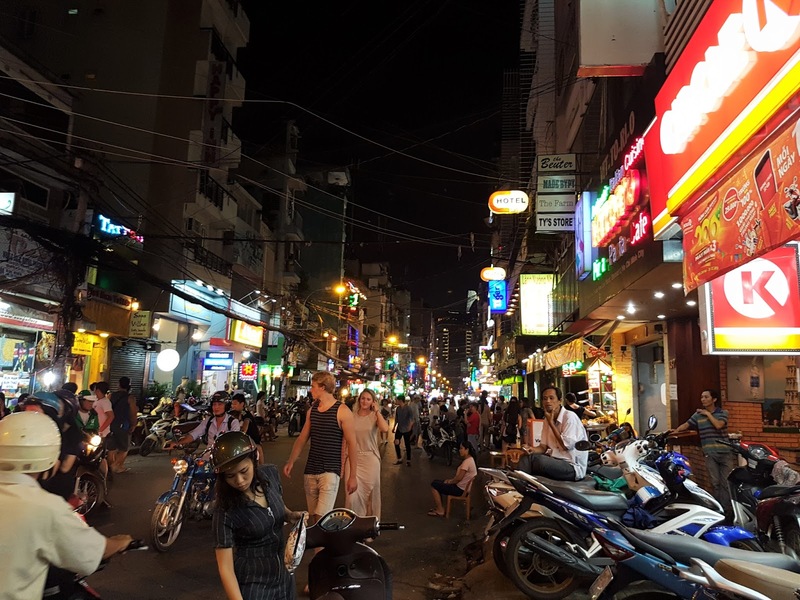 We decided to have a bit of a night out that night and had heard about a popular drinking street. 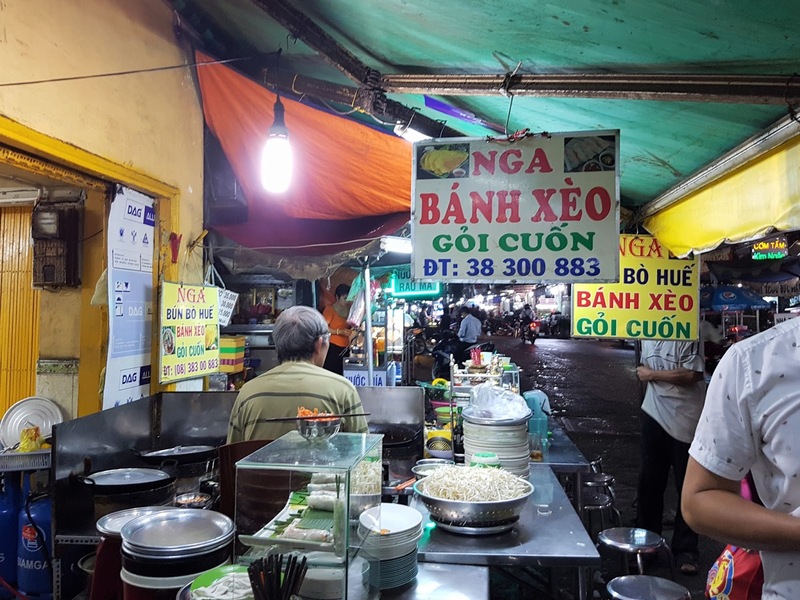 We first stopped to fuel up at a recommended Bahn Mi place from our street food tour guide the other night called ‘Huynh Hoa’. It was just the next street over from our hotel and we knew it was good as soon as we saw a long line of locals lining up down the street for it! We got one each with everything on it- which was less than $2. Cheap dinner! It was SO good. 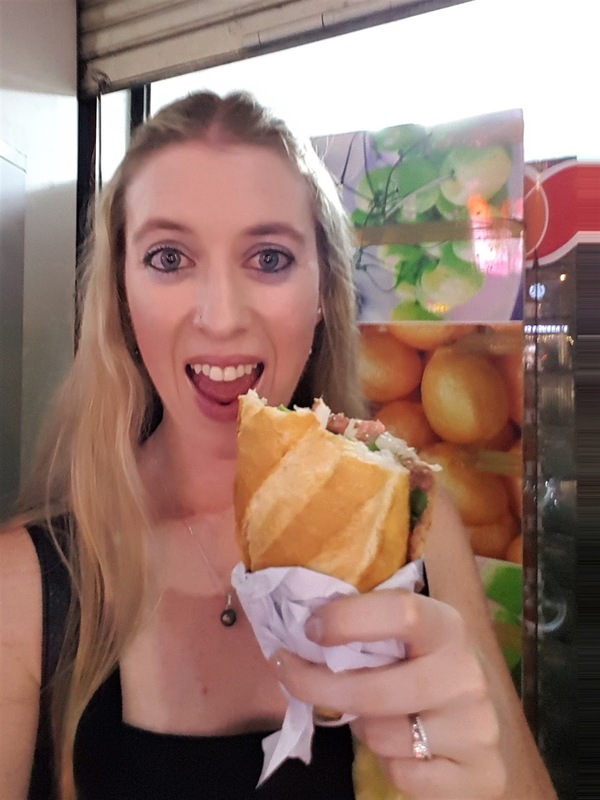 It was the best sandwich I had in Vietnam, I tried many other places after that- nothing compared! After our sandwich we spent the rest of the evening on the ‘party street’ which was called ‘Pham Ngu Lao’ which is basically a long road of bars and clubs and tourist souvenir shops. It’s not really Gareth and I’s thing- but we do enjoy a drink so we thought we should at least check it out. We mostly just sat outside the bars enjoying a beer and people watching. Although a lot of people do come up to you trying to sell things. We also browsed a few shops and I bought a cool bracelet (I collect one from each country I go to) and a cool Star Wars Yoda singlet. We finished up at ‘The View’ which was part of a hotel that had a rooftop bar. I just guessed by the name that there would be a nice view and I was right! On the way back to our hotel at about midnight we stopped at the sweet sticky rice cart we had seen the other night and tried a bit of everything. He put salt over it too so it was sweet and salty- so yum! Today was our last full day and we didn’t really have any plans except to walk around some more and try do a bit of shopping. We walked to Vincom Shopping Centre as it was said to be the best mall, but we didn’t really find anything in there. 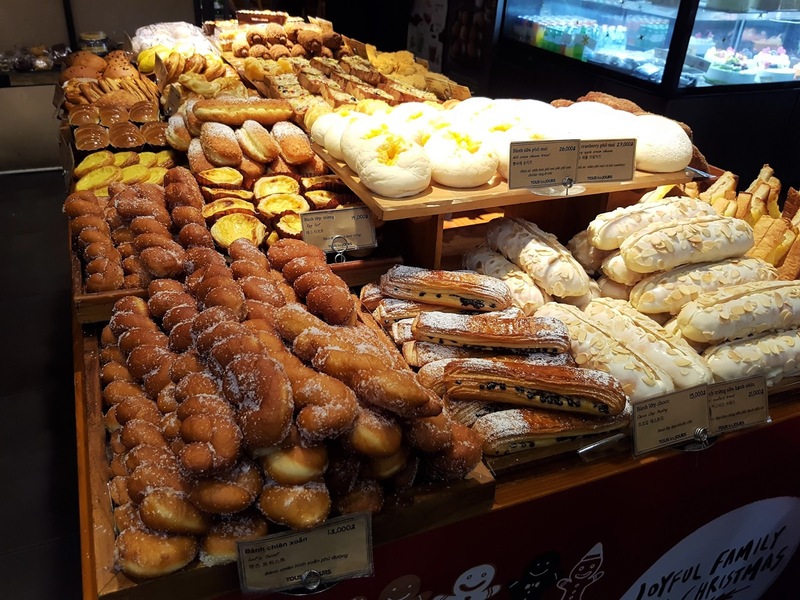 There was however a great food court and we couldn’t help going into a delicious looking French Bakery (just in case you didn’t know- there is still a huge French influence in Vietnam as they were ruled by them for 100 years). We each got a custard pastry which was amazeballs. So many goodies to choose from! When then said hi to Uncle Ho (this is what the Vietnamese affectionately call their great past leader Ho Chi Minh- who now the city is named after). There is a big bronze statue of him in a court placed in front of the City Hall. A group of young school girls approached us and asked if they could ask us some questions to help practice their English. They were so cute! We were more than happy to, especially as I had to do that last year too as an activity in my German class and only speak to the locals in German. We then ventured back towards the hotel via the Ben Thanh Markets again and had a proper look through, but we didn’t get anything as in my opinion it’s just mostly full of cheap and low quality things. But if you’re looking for cheap souvenirs or presents then I would recommend it for that. As it was a very hot day we had a nice swim in the pool and chilled for the rest of the afternoon. We had heard of a great cocktail rooftop bar called SkyBar which has amazing views so we headed there at 5 pm to watch the sunset but for some reason it was shut until 6:30 pm which we were a bit disappointed about. But it turned out to be a good thing as a big storm was rolling in and we noticed the sky was getting very dark quickly! 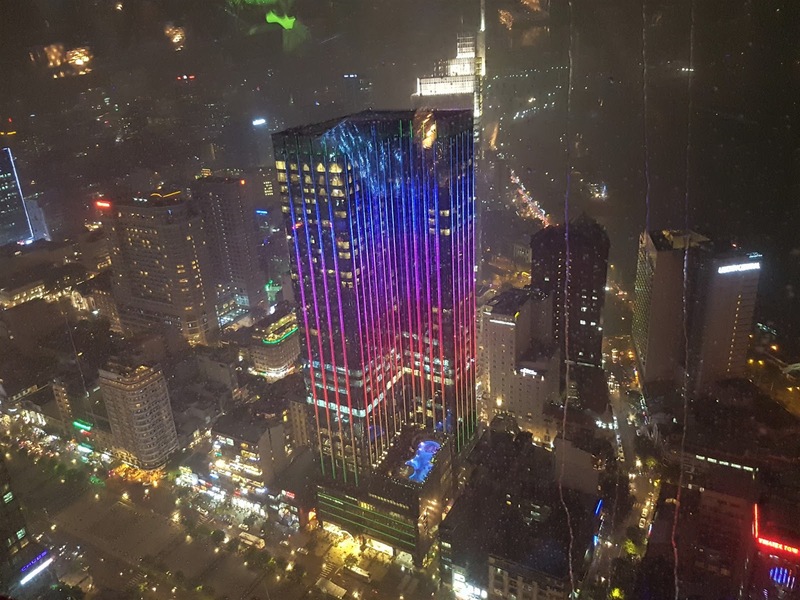 So we walked as fast as we could to the Sky Deck as a backup- which is the tallest building in HCMC. To go up to the observatory deck it costs $10 per person or if you’re just going to the bar or restaurant then it is free- but the drinks are rather expensive up there. It was worth it in my opinion for the view and also to get out of the rain which started hammering down just after we arrived! We spent about an hour and a half up there but the rain wasn’t ceasing. We ended up buying an umbrella to walk to our dinner spot which wasn’t too far away. Gareth wanted to go to the Hard Rock Cafe as he felt like a burger and I was more than happy to spend our last night there, as I’ve been to a few around the world. It was very nice and the food was good and huge portions. 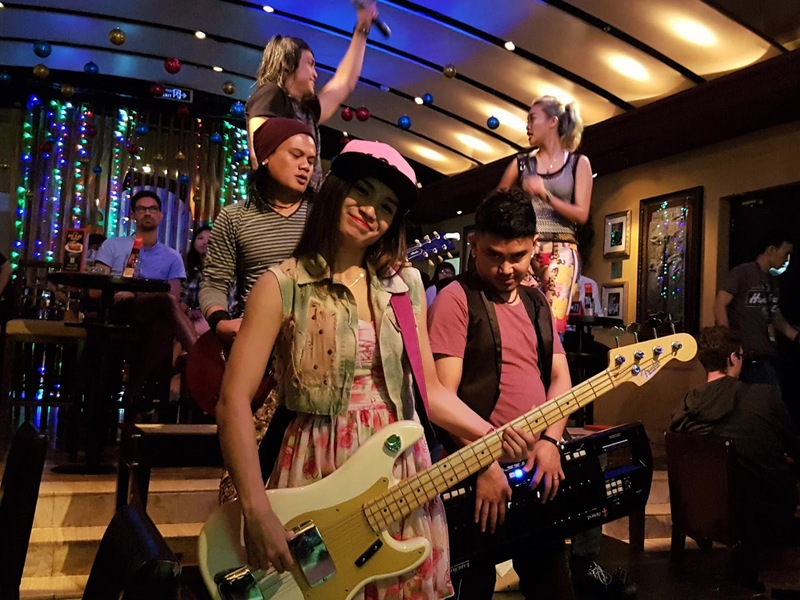 There was a really talented live Vietnamese rock band playing there as well. We had a couple more drinks and then walked all the way back to the hotel- we were more than happy to as we were SO full! It was about a half an hour walk and my legs were so sore by the time we got there- we had walked so much that day- over 23,000 steps. We packed our suitcases ready for our flight tomorrow and fell into bed! It was an early start and we had one last pho for breakfast before checking out. 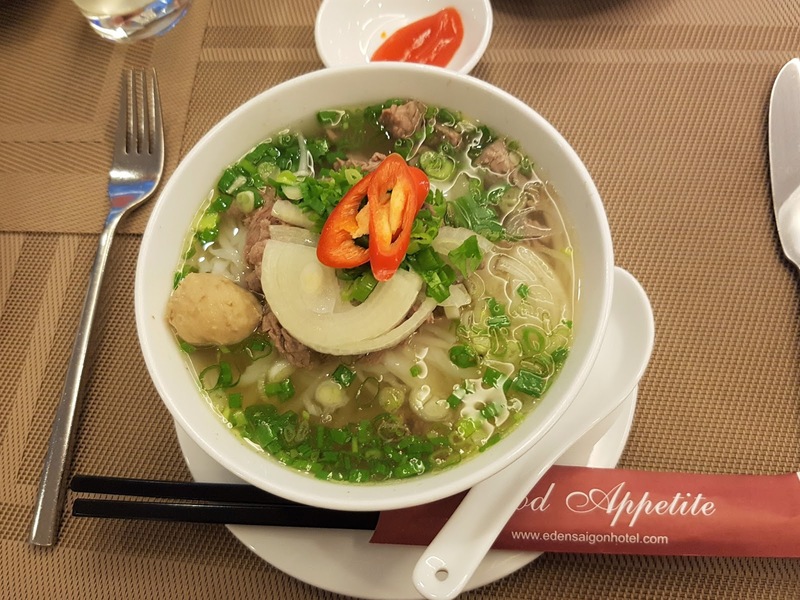 The airport was about a 20 minute drive away and it cost 130k VND for both of us ($8 AUD). 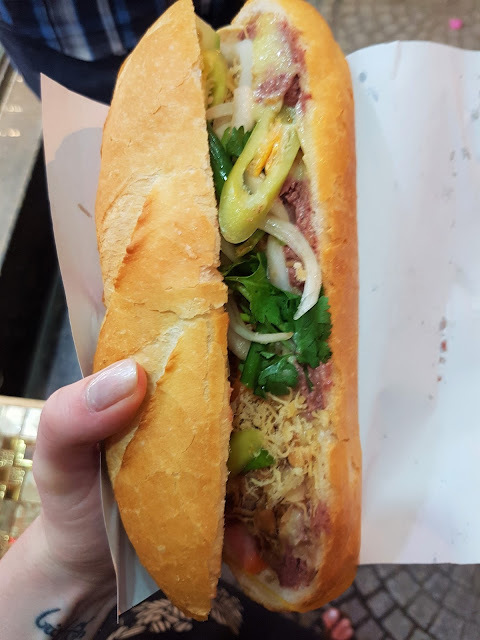 We checked our bags, had a coffee from Highlands and got a Bahn Mi from the airport to take on the plane with us for lunch, as it was a two hour flight. 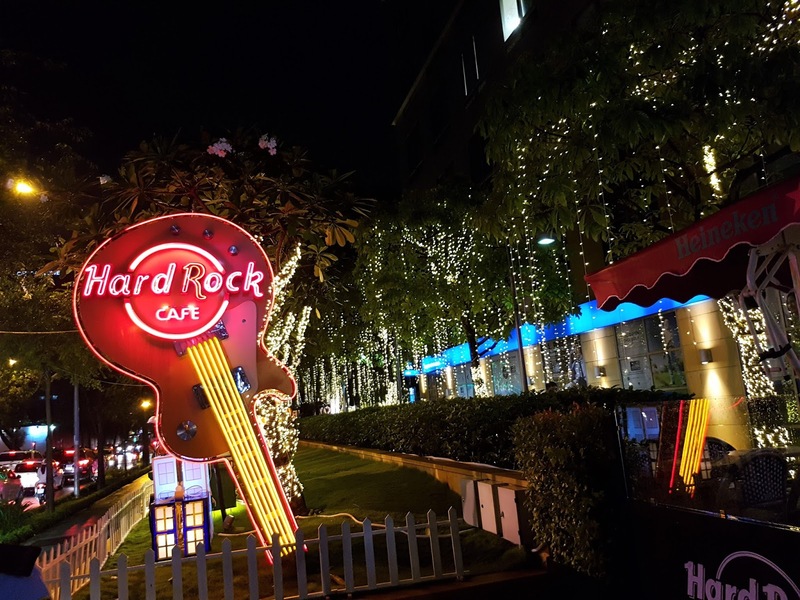 We flew right to the top of the country to Vietnam’s capital city Hanoi. 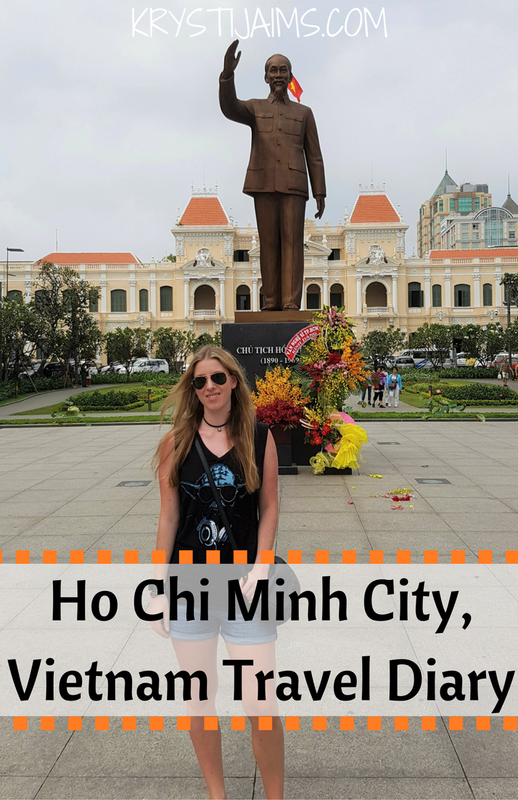 And that brings us to the end of my Ho Chi Minh City adventures! Wow so this turned out to be a lot longer and more detailed than I had intended- hope you don’t mind! I had a really great time there and felt 5 nights went so fast and it was definitely not enough! 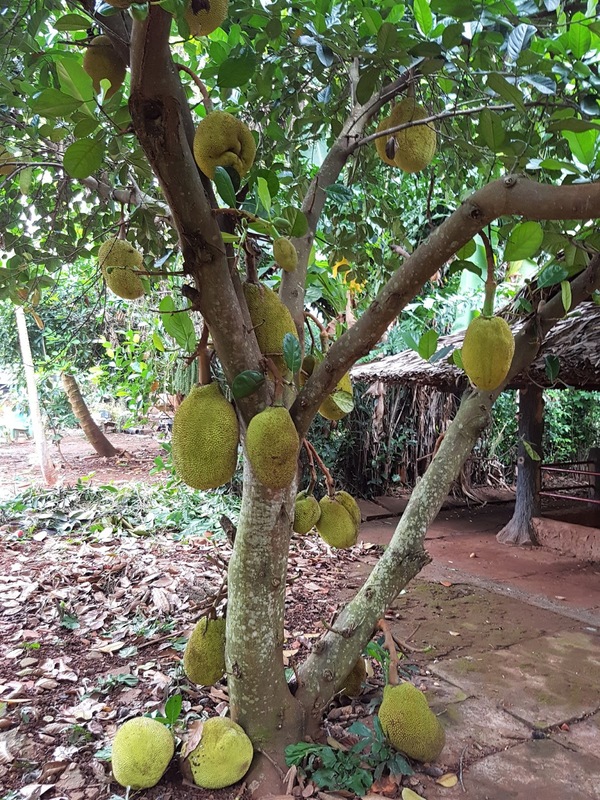 It is such a large city that we barely scratched the surface, and I would have loved to do another day trip to the Mekong Delta as well- home to the floating markets. Definitely next time- Gareth and I can’t wait to return to Vietnam and we are hoping we can do it properly- at least for a couple of months travelling the whole country. 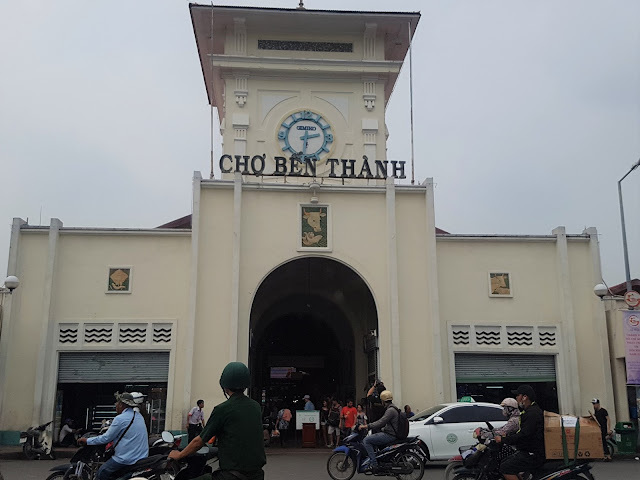 Coming next will be my Hanoi and then Halong Bay Travel Diaries, so stay tuned for the next parts in my Vietnamese adventure. Thank you so much for reading and I wish everyone a very Merry Christmas and a Happy New Year.